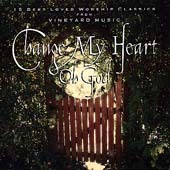 Change My Heart Oh God: Vineyard Music EXTRA! I like this album overall very much. I noticed, though, that certain songs seem more relevant to me and also just better than the others. I think the most original songs are: Refiners Fire, Glory, I Believe in Jesus, Eternity, Holy and Anointed One, Light the Fire Again, and The River is Here. I also like More Love, More Power and Isnt He. Sweet Wind is good, too. But Sweet Wind is hard to sing along with, and has too much percussion emphasis to it. If I ever thought the singer seemed to be singing in a showy manner (maybe? ), it would be on this song! But its still OK.
Isnt He and More Love, More Power and Glory are not very creative compared to Light the Fire Again and Holy and Anointed One. Glory is a very singable song, though, and comes to mind often after the CD player is turned off. All told, I was very happy to get this album and learn all the songs I had never heard before. The first two tracks  including Spirit Song  I had heard on the radio, plus Isnt He. I Believe in Jesus I had already heard on tape. It makes a difference when one has already heard a song several times with different versions. Its worth buying to hear songs like The River is Here. Once I had heard Holy and Anointed One on this album, I was able to sing along when I heard it at a church, which was a great experience. My criticism is not intended to be on the heavy side  I enjoyed this album and will play it again and again. My favorite song on this CD is probably Light the Fire Again. I hear the drums on that song and wish they werent SO LOUD; but then I get caught up in the lyrics and think about what the message is, and thats all that really matters, after all.